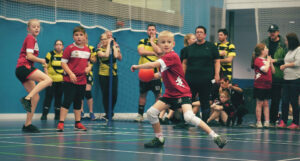 It is likely you have noticed a lot of activity and development in dodgeball within the region of Greater Manchester. The reason for this is because of the work of many, and the collaborations that can come from a collective passion. We wanted to give you an insight into the story of this growth, and how it all formed from the positive attitude of the Manchester Bees. And importantly, if you are a club that is inspired by this, there is a proven journey for how you can achieve this; And British Dodgeball are here to help anyone with these dreams. "Manchester Bees are a really progressive, forward thinking club and this has shown in the growth of the club over the last few years. Their eagerness to support the Manchester community is second to none. We have had the pleasure of working with the Bees on their successful Clubmark accreditation and developing a workplace offer which will see companies from across Manchester try Dodgeball for the first time, both demonstrating their desire to grow the game." Manchester Bees Dodgeball have just won the prestigious Club of the Year Award at the highly competitive Manchester Sports Awards. This is timely for the club, who have been operating for 5 years, as it coincides with lots of developments happening in the area. 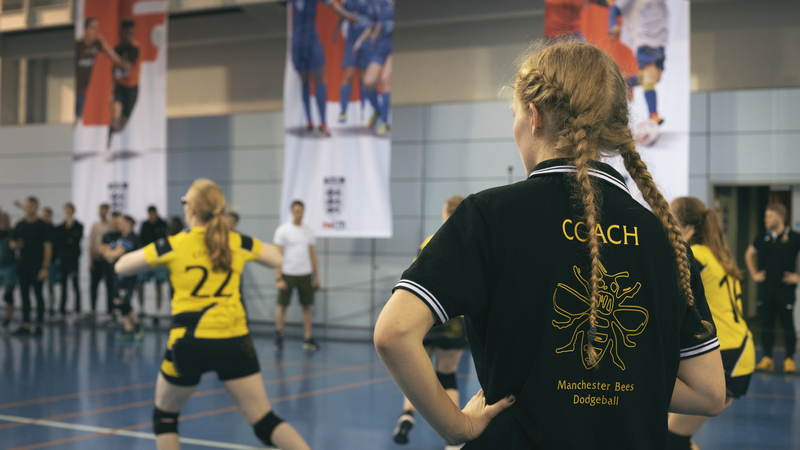 Manchester Bees have created a successful model for developing a community dodgeball club which is transferable to many areas of the country. The lynchpin of this success is the club’s fun and inclusive attitude; anyone can join the club’s social sessions and beginners are encouraged to bring friends along and enjoy an alternative way to play sport and get active. 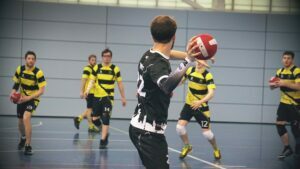 There is still a place for competitive squads (Bees have 3 teams in this year’s British Dodgeball Super Leagues) but competing at the highest level is just one aspect of everything the club does. Many hands make light work. Manchester Bees have a committee made up of nearly 20 people split into coaching, marketing, development and administration (finances, social events, kit/equipment, charity work). Not only does this mean that nobody is being drained by working too hard on their own, but it also means more people get to take ownership of the club and become more invested in its success. Key positions such as the head coach, and marketing officer lead teams of 5 people to ensure that the club’s approach is consistent. Originally, the club did some face to face marketing in the streets of Manchester, but found that sites such as gumtree were more useful for attracting newcomers alongside encouraging existing members to invite friends along. Manchester Bees have created a network of clubs which all work together in order to develop sport in the area. This consists of Wilmslow Wasps, Cheadle and Gatley Griffins, Altrincham Dodgers, Manchester University Dodgeball Society and MMU Dodgeball. - Formed in Jan 2013 by 4 MUDS graduates that wanted further opportunities to play. - Club brought Aden Woodall in as Chair in 2014 and Ross McGuigan in as Club Development Officer in 2015. - Aden grew the committee from 6 people to 17, and began putting systems in place for all the committee members to work collaboratively (making a committee handbook to define each committee member’s roles and structuring marketing, coaching and development subcommittees each with a leader). - Ross arranged corporate events, outreach events (such as attending the Wythenshawe Games), and charity events (such as a 24hr dodgeball challenge with proceeds going to 2 charities the Christie Foundation Trust and the Bumblebee Conservation Trust) to raise dodgeball’s profile in the community. - The club actively contacted Greater Sport (the local County Sport Partnership) looking for funding and venue support. Successfully secured 3 funding bids to develop women’s and junior dodgeball by creating a relationship with Greater Sport. - Throughout the club’s first 3 years operating, various members played internationally and 3 members became head coaches for their international teams – Bru Cousins for NI, Lewis Brimmell for Wales and Rob Kearns for Republic of Ireland. They brought back lots of knowledge to club sessions. - Aden worked with the club Secretary Tom Shelbrooke to create all of the policies needed for a club to operate safely and effectively such as a data protection policy, and a health and safety policy. Templates of these are available in the Club Resources section of the BD website. As a result of this, alongside the work the club was doing to recruit and retain members as well as offering good coaching opportunities for members, the club earned Clubmark accreditation in 2016. - Due to the marketing team’s work promoting the club through graphics/videos, bring-a-friend initiatives etc., the club grew to over 40 members. 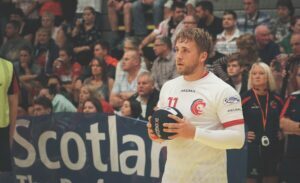 - Since becoming members of BD, Aden contacted Ben Hoyle, British Dodgeball’s Director of Development, to ask about helping other clubs in the country to develop themselves and was made a volunteer club development officer for British Dodgeball. - Manchester Bees still continued to grow (to over 70 members this season) via word of mouth and marketing through various social media streams. The club are also actively trying to get involved with radio/television shows in order to raise dodgeball’s profile as well as getting members to contribute to blogs, and write articles for company/residential and sporting newsletters to further advertise the club. - All members are encouraged to join the committee or help the club by fitting into any niche where they feel they can help – working with match footage, charity work are some recent examples of this. - Ross and new treasurer Zac Baker introduced a volunteer scheme which gives free sessions/prizes to volunteers who attend outreach events or junior events in order to encourage members to be active in the local dodgeball community. - The development subcommittee wished to create a network for dodgeball clubs in the local area, meaning clubs had better relationships to gain knowledge from one another, organise transport and friendlies and become a thriving community. To this end, they created the Manchester Dodgeball Community group. This is a group made up of all local community, junior and university team and organises Community Cup events for everyone to get together and play. The three most recent events have had 50+ people attending each. This has helped newer clubs such as the Wilmslow Wasps to establish themselves and learn tactics of the game at an accelerated rate. - Aden was the driving force behind creating links between Manchester Bees Dodgeball club and schools in Hulme by donating dodgeballs to schools to give them the opportunity to play in PE lessons and get more active at break times. 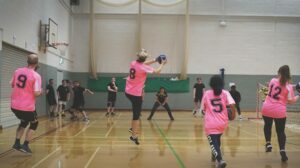 - The formation of the Manchester Dodgeball Community led to British Dodgeball trialling a new competition type in Manchester – the City League. This was a success with 8 teams entering, and 107 participants playing dodgeball monthly on a Monday night with over 50 of these new to dodgeball. - The club led two charity events this year which raised money for a local charity, the Christie NHS Foundation Trust, alongside then other club charity, the Bumblebee Conservation Trust. They also organised a dodgeball doubles event where all the proceeds were donated to Sports Relief. The club were proud to be part of the Wythenshawe Games, which saw over 1050 young people engage with dodgeball over the three days the club were present. This has been the 5th year in which the club has attended, and they were honoured to be asked and placed in a central position within the event because of the popularity of the club. - The club was given the opportunity to deliver dodgeball provision at the Rainbow Playground, a Proud Trust-led event open to LGBT young people and youth groups aged 16-25years old. The event ran all day and allowed all the different groups of people to join in and experience a new sporting activity. Bees also attended the Festival of Manchester in September order to promote playing opportunities for adults and young people. - Bees funded training for 7 Level 2 coaches in the last year and 3 level 3 coaches in order to ensure that enough coaches are on hand to deliver high quality sessions and give feedback to their members. - Alex Huband stepped into the role of Sponsorship Officer and worked tirelessly sending letters out to companies until a deal was struck with Totus Environmental Ltd., who are the current main sponsor of Manchester Bees. - Manchester Bees set up an academy team based in Stockport where the majority of active junior players lived for 14-16 yr olds. In September, this became a club in its own right – the Heaton Hurricanes, and Bees are in the midst of setting up a new Academy in South Manchester where the club is based. Coaches are going in to school in their spare time in order to promote the club and ensure that numbers are high when the club launches. - Manchester Bees maintained a strong relationship with Greater Sport and were encouraged to apply for the Manchester Sports Awards. They applied and won the club of the year category and are through to the Greater Manchester Sports Awards. “Aden’s determination to succeed, his versatility with his community engagement and his motivation from a grassroots level of varying ages to an elite level really stand out. His determination to succeed isn’t only something you would relate to his first team club and international level appearances, but to his devotion to train hard and help others to achieve their full potential. He actively spends time with people who have only just begun to engage with the sport and acts as a role model to juniors participating in the sport. This mentality is infectious and it motivates people to become better both in and outside of their sporting experiences. The versatility he has to engage with the Manchester community inspires people to not only participate in the sport but to become more involved in its development. One day, he has been playing in the World Cup in New York then next he’s been supporting a local community event (e.g. the upcoming Festival of Manchester) to promote the club and the sport. British Dodgeball were proud to recruit Aden after his passionate and extensive volunteer work developing the Greater Manchester area with dodgeball. His skills and experience are now a tool that can be accessed by our members to help them grow their own clubs. "Dodgeball is more than just a sport; its fun, social nature has the ability to involve people that usually wouldn't engage with traditional activities. I'm loving every day working for British Dodgeball to drive this incredible sport forwards at a grass roots level. The work I've done at club level with Manchester Bees has given me an understanding of the main barriers we come up against whilst developing minority sport clubs. That said, I believe that with the right team, any dodgeball club can strive towards long-term success by ensuring sessions are top quality, working hard to attract and develop its member-base and by collaborating with relevant organisations such as County Sport Partnerships. I want more clubs to have success on a development front and am more than willing to offer guidance and support to clubs that need direction on where to go next. "We are really excited to be involved in the grass roots development and expansion of dodgeball in Manchester. Having a platform and a voice to help grow and shape a sport we are really passionate about is brilliant and unique. Under Aden’s guidance and support the Manchester development group and pilot leagues are helping to shape the future of Dodgeball nationwide and we couldn’t be happier to be a part of it!" British Dodgeball is proud to be working closely with the Manchester dodgeball community in so many ways. Currently we are shortlisted for the Aviva Community Fund, which if we achieve will have massive benefit on so many lives in the area. Our project aims to provide young adults with the necessary skills and qualifications, through dodgeball coach education, to be able to make a positive impact on the lives of adults, older aged adults and children within their community. We are at the stage of a public vote, please can you show your support for this project by casting a vote for us and help us achieve in Manchester, as we grow steps to achieve heights like this all over the UK.